On Monday 15 April, Botswana became the first African country to sign and ratify amendments to the Rome Statute of the International Criminal Court (ICC) that could pave way for the prosecution of the crime of aggression. 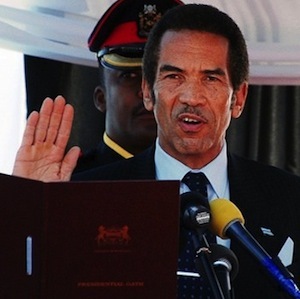 In his speech ahead of the signing of the ratification document, the President of Botswana, Seretse Khama Ian Khama, reiterated the country’s commitment to international criminal justice in general and the ICC specifically in fighting impunity globally. He said that international criminal justice should not be impaired by the status of the accused and that domestic and international prosecutions are the best mechanism to respond to international crimes. This is a welcome development and evidence of the impact of the Global Institute for the Prevention of the Crime of Aggression and the Principality of Liechtenstein’s international ratification campaign, which promotes the ratification and implementation of the Kampala amendments on the crime of aggression. The crime covers the planning, preparation, initiation or execution of an act of aggression by a person in a leadership position. This act of aggression must also constitute a manifest violation of the Charter of the United Nations (UN). Acts of aggression are any use of armed force by one state against another without the justification of self-defence or authorisation by the UN Security Council. For African countries, the importance of allowing the ICC and its member states to prosecute the crime of aggression cannot be overstated. Indeed, Africa has historically been a victim of aggression (in various forms). In 1998 in Rome, when the Statute of the ICC was adopted, and in 2010 at the Review Conference of the Rome Statute of the ICC in Kampala, African states parties actively sought the inclusion and definition of the crime of aggression. However, ratifying these amendments is significant not only to Africa but to all countries – several of whom have suffered as a result of the aggression of other states. Ratification would serve as a first step to promoting international peace and the rule of law. The express prohibition of the illegal use of force contained in the definition of the crime of aggression and the threat of criminal sanction could prevent future illegal uses of force. Also, states that ratify would effectively protect themselves against aggression by another state and would publicly pledge not to commit aggression. This would be in line with the promises made at Nuremberg that never again would those who commit the crime of aggression do so with impunity following the conviction of senior German officials for waging aggressive war during the Second World War. The criminalisation of the crime of aggression serves to protect human rights. By their very nature, acts of aggression result in gross human rights violations and the violation of international humanitarian law. Those who often end up counting the cost of aggression are the most vulnerable of society, particularly women and children. Ratification reflects continued support for the ICC and international criminal justice. While the 122 countries that have ratified the Rome Statute have already shown their commitment, ratifying the amendments would serve to bolster this commitment. Nevertheless, the inclusion and definition of the crime of aggression in the Rome Statute is not without its challenges and detractors. Indeed, at the time that the Rome Statute was being considered, the issue of whether or not to include the crime of aggression was the subject of immense debate. Countries like the United Kingdom and the United States, who prosecuted aggression at Nuremberg, were ironically the ones who argued against its inclusion. Their concerns related to legal constraints on their ability to mount military or humanitarian interventions. Further, it was (and has been) argued that the crime of aggression is an issue of a political rather than a legal nature and should thus remain the remit of the UN Security Council, not a judicial body such as the ICC. A large contingent of states (from Africa, the Arab world, Europe and those that are non-aligned) supported its inclusion in the Rome Statute. The resultant statute incorporated the crime of aggression, but did not define the crime and put off the ICC’s exercise of jurisdiction over this crime until such a time as a definition was agreed. This definition was agreed upon in 2010 and can be seen as a compromise between the two divergent views on the crime. However, the ability of the ICC to exercise such jurisdiction was postponed until at least 2017. The adoption of a definition on the crime of aggression and the inclusion of additional war crimes in the Rome Statute was a giant leap for international criminal justice. It was a further affirmation by states of their commitment to international justice, peace and security. The crime of aggression, unlike the other offences under the Rome Statute, specifically targets national leaders who are in a position to effectively exercise control over or direct the political or military action of a state. The prosecution of this offence by the ICC will ensure accountability for the most serious illegal uses of force against other states. The journey, however, has been arduous and could remain so if states do not follow through on their affirmation by ratifying. Indeed, states should be seen to actively commit to international criminal justice rather than merely making declarations. Without action, these declarations may be viewed as nothing more than empty promises. This ISS Today has been published on The Global Campaign for Ratification and Implementation of the Kampala Amendments on the Crime of Aggression website.